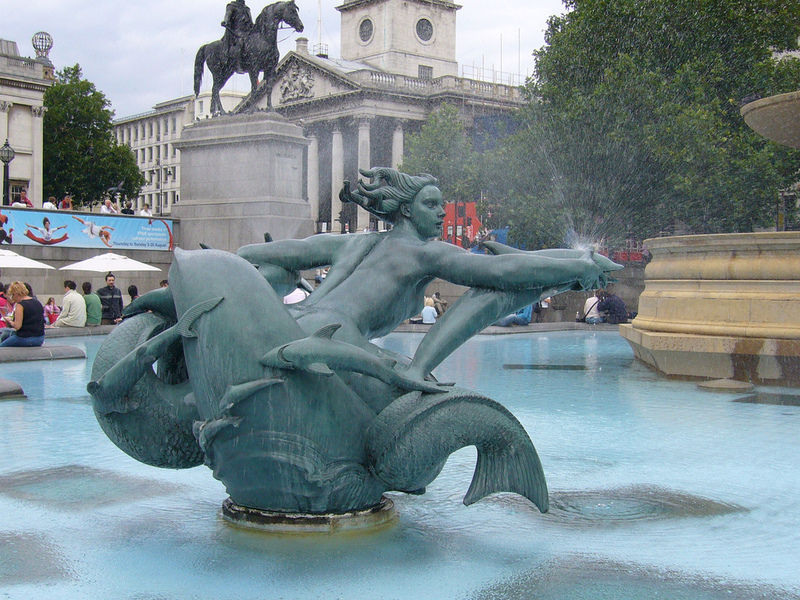 Mermaid statue by Sir Charles Wheeler in the Trafalgar Square Jellycoe fountain. Photo © by Wouter Demuynck. 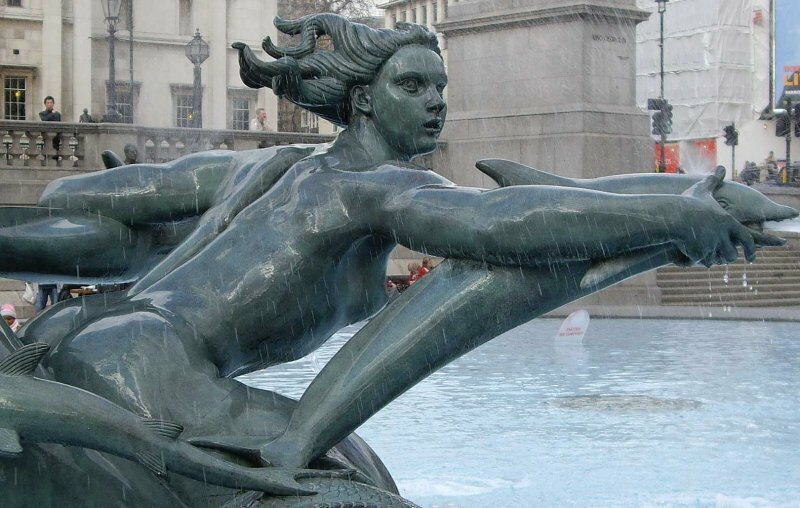 Another Trafalgar Square Mermaid sculpture by Wheeler. Photo © by Colby Cosh. 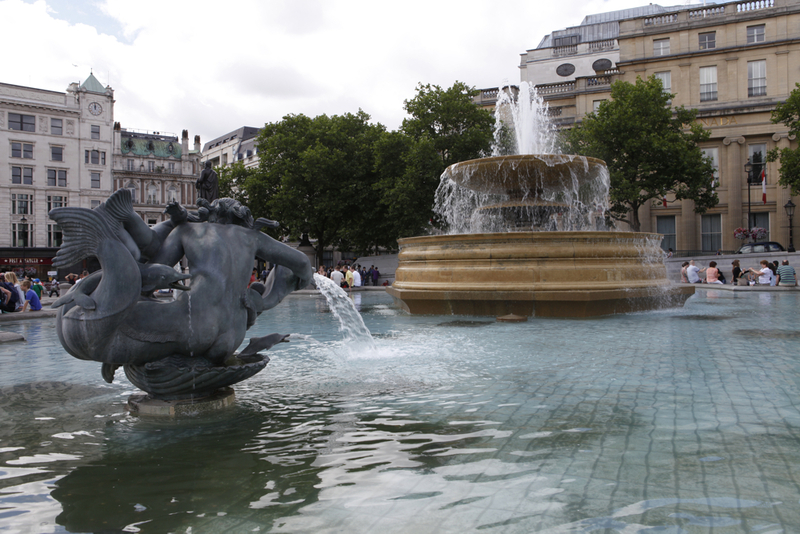 The fountains were originally created in 1845, but without the sculptures. At the time the fountains were intended to simply take up space in Trafalgar Square, so that there would be less space available for demonstrators and rioters. 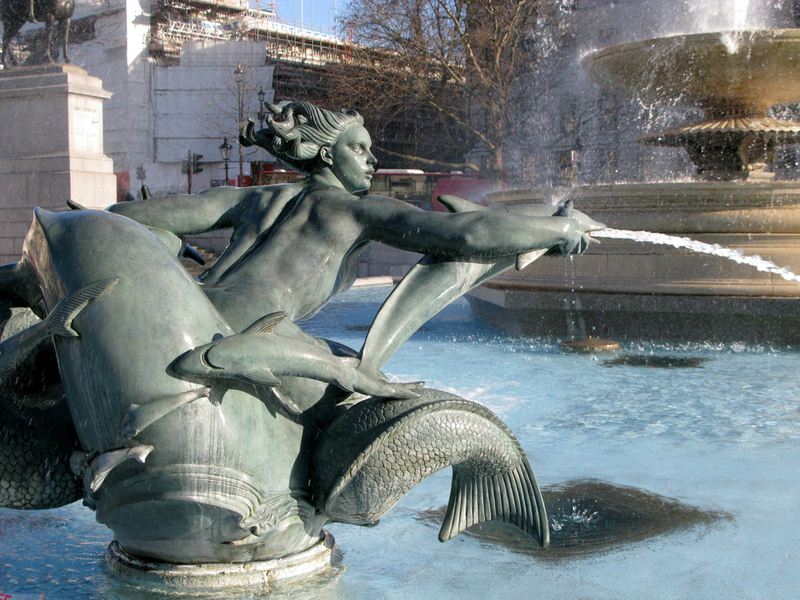 In 1935 plans were approved by parliament to add memorials to these fountains, and also these sea-creature sculptures by McMillan and Wheeler. 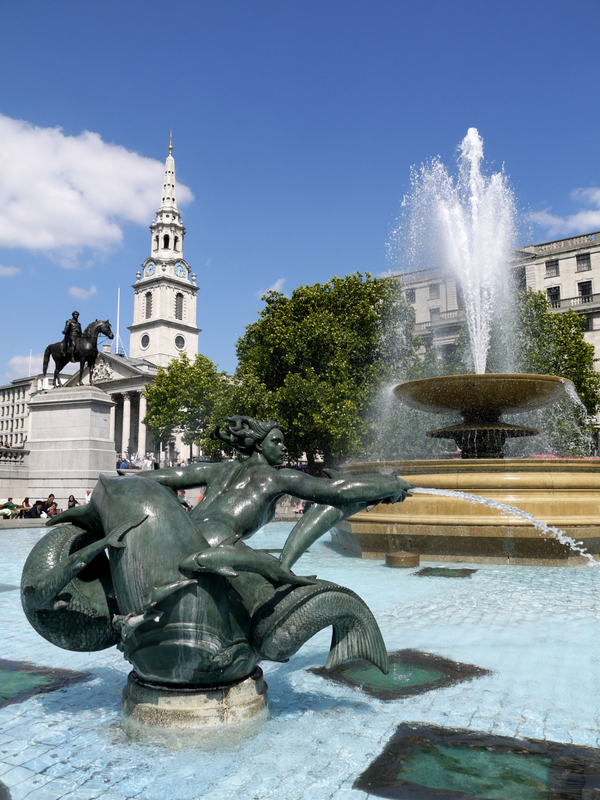 The bronze statues were completed in 1939, but due to the war all work on Trafalgar Square was suspended at that time. Work on this did not resume until after the war in 1947. The finished memorials and the fountains were unveiled in October of 1948. The mermaid statues do not have the traditional single tail, but instead have long and powerful tails as an extension of each thigh. Trafalgar Square mermaid statue. Photo © by Davide Simonetti. 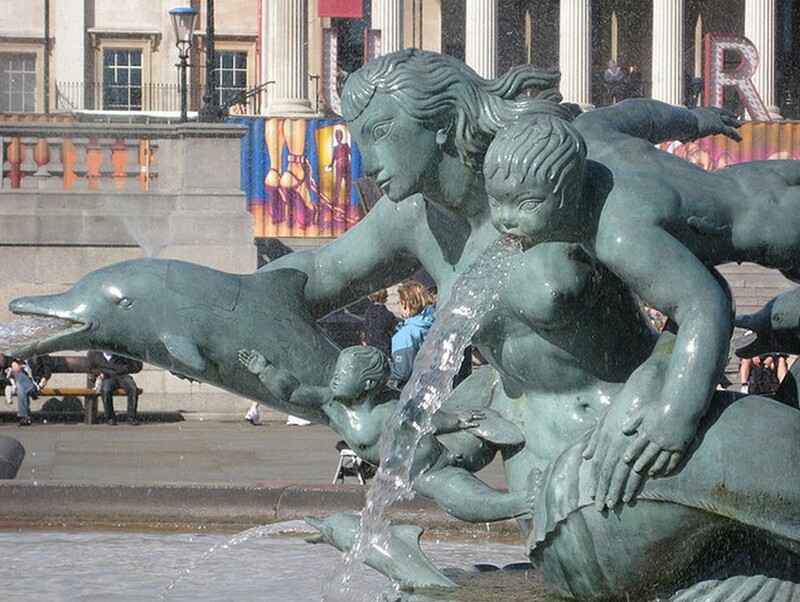 Trafalgar Square Mermaid sculpture in Jellycoe Fountain. Photo © by Wouter Demuynck. 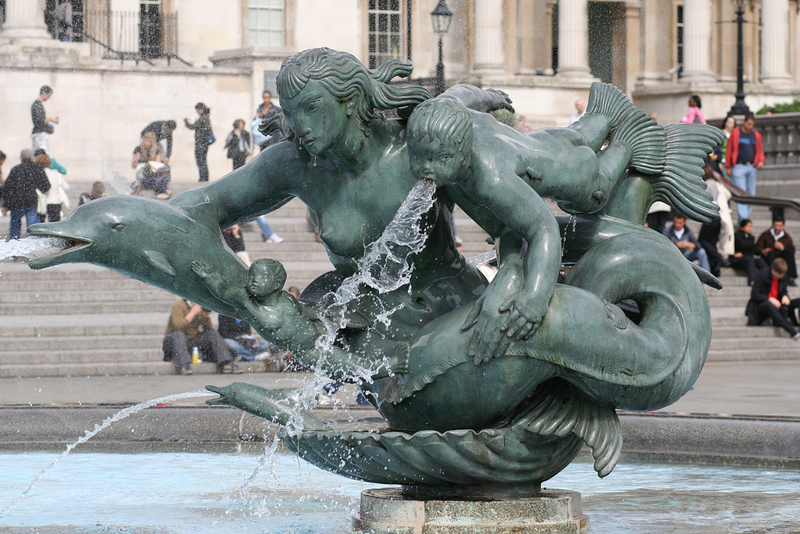 Trafalgar Square Mermaid sculpture. Photo © by Colby Cosh. Trafalgar Square mermaid statue. Photo © by Ians’ Photography. Trafalgar Square mermaid statue. Photo © by Mike Smith. Trafalgar Square mermaid statue. Photo © by Tim Willcox. Additional images: More images are needed of these mermaid sculptures. If you would like to help with additional photographs, please contact us. Photos must be yours, 10 megapixel or better. We can only accept photos if you give us full rights to use them in print and digital media.